Update: we're postponing tonight's maintenance window, so there will be no scheduled downtime of TypePad this weekend. You can blog, your readers can read, and everyone should have a great weekend. This Friday evening, December 1st, starting at 10:00 pm PST, we'll be taking TypePad offline for approximately one hour to perform routine maintenance. During this time, the TypePad service, all TypePad blogs, and the TypeKey authentication service will be unavailable. Our friend Debbie Weil, author of The Corporate Blogging Book (which we featured at books.typepad.com last month), has just launched The Corporate Blogging Show, a weekly radio show on Voice America. Debbie was kind enough to invite us to participate in the first episode, which aired this week and is available as a downloadable podcast. The topic was "how to get started with a corporate blog," and we covered a lot of ground -- from how to best integrate your blog with your site to who in your organization should be blogging. Many thanks to Debbie for including us, and best of luck to her with the weekly show! We've been fans of Steven Johnson ever since his Feedmag.com days of the late '90s, and Interface Culture, his seminal book on computer user interfaces. (Interface Culture is worth revisiting now, especially for its chapter on the simple hyperlink, the building block of blogs.) His latest book, The Ghost Map, chronicles a pivotal outbreak of cholera in 1854 London, and is our featured book of the month at books.typepad.com. Yesterday Anil Dash and I had the pleasure of talking with Steven about his new book, life in mid-19th century London, life in early 21st century Brooklyn, and his new startup, Outside.in, a site that lets you share and discover what's happening in your neighborhood. Steven blogs on TypePad, of course, at stevenberlinjohnson.com. You can listen to the conversation here, or grab the MP3 file directly. As part of the Widgets Live conference this week, we announced a partnership with our friends at Widgetbox, the online directory and development site for web widgets. Widgetbox has supported the TypePad Widget API since the day they launched the service, which means that any Widget you find on Widgetbox you can install on TypePad. As part of working together, we've syndicated their featured and new widget listings into the sidebar of our own Widget Gallery. (We used their Widgets, of course, to make this happen.) In short, if you're looking for a Widget you can't find in our gallery, check out Widgetbox, since they make it easy to add their Widgets to your TypePad blog. The MeeVee "What I'm Watching" widget lets you share what television shows you're watching through their online guide. Evoca's Browser Mic widget enables any of your blog's readers with a computer mic to leave you a voice recording which you then can decide to post to your blog. The Feed Crier IM Subscription widget allows readers to subscribe to instant messaging alerts from your blog. We're always working with new partners, and have more great Widgets in the works. If you're interested in developing your own Widgets (it's easy!) then check out our TypePad Widget Developers guide. If you've been following along with Featured TypePad blogs, you've probably noticed that quite a number of businesses -- large and small -- are using TypePad to get the word out about their products and services. 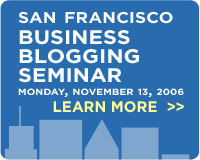 There's been so much demand for information about effective business blogging that we're hosting a seminar in San Francisco on Monday, November 13th at the Le Meridien Hotel. Visit our Business Blogging Seminar site for more details and to receive a special early registration fee. One of the challenges of running a large and popular blog service (with a lot of very popular blogs) is that we've become an ever larger and more attractive target for spammers. More spam to filter means more computing dedicated to stopping it, which can occasionally mean degraded performance of the service. Recently, the service has been hit with a number of particularly large-scale spam attacks, some of which have impacted TypePad's performance and availability. While we want to acknowledge the issue and explain the cause, for obvious reasons we can't go into specific details about the types of attacks we're seeing or the methods we're using to defend the service and your blogs from the attacks. Our site operations team has been working around the clock to monitor TypePad and keep the service up and performing well for you. Meanwhile, our engineering team is working on a new approach for combating spam, which we hope will improve our ability to block spam and keep the service performing well. We appreciate your continued patience and support. And as a reminder, if you're interested in real-time information about the state of TypePad, you can bookmark status.sixapart.com or subscribe to its feed.